Wow! Many, many thanks to Scott for going above and beyond with these answers! Awesome stuff! 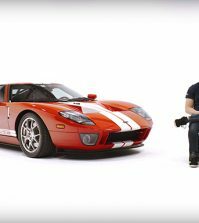 What was your role as the Ford GT Chassis Design/Vehicle Dynamics and Development engineer? The nature of the program and the small team meant many of us took on roles way beyond typical at Ford (or any other major manufacturer for that matter). For a non-standard example, I led establishment of a program mission statement and a ranked set of “live or die” goals (aesthetics versus handling versus ride comfort versus straight-line, etc.) when they were absent early on in the program. This work is typically led by the Chief Engineer at Ford. I could see we needed these goals badly to identify a clear direction and we ranked them to make tradeoff decisions between conflicting goals. My more standard and expected roles included leading chassis architecture decisions up front with chassis teammate/supervisor Huibert Mees. Decisions including the space frame architecture with aluminum extrusions and cast nodes, the suspension control arm layout (“L-arm” lower versus “A-Arm”) and attachment methods to the frame. I led all of the chassis requirement target setting as well since I was the first chassis and vehicle dynamics engineer on the program. I set the ride height of the car and completed tire clearance envelopes (clearance to inner fender) early in the program working hard to minimize impact on the already designed body. From a detail design standpoint I was responsible for springs, shock modules, anti-rollbars, and suspension fastening to the frame. I shared responsibility for control arm modules and the knuckles. I completed the final suspension geometry for the GT and set bushing stiffness to achieve our targets. Due to my background and program timing I also led and completed all of our vehicle dynamic modeling and analysis for design and development decisions. Once my design role was complete, I transitioned to ride and handling development with Mark McGowan and others since I had background/driving certification at Ford. And then finally I had production responsibilities, somewhat for the overall car, but primarily chassis related. 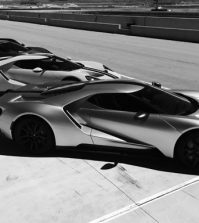 What was in your background that led you to the Ford GT program, as it was a “dream team” of sorts? You could say I had been preparing for the Ford GT assignment since I was a child. I was born a gearhead. My Dad was into cars and I will never forget my first ride in his Austin-Healey Bugeye Sprite at 4 years old as he was hammering through a clover leaf…I was hooked on cornering speed for life. 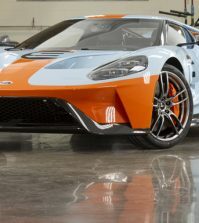 Design of cars like the GT was goal since I was 8 years old and was on the path with passion and fortunately ability to get there including three years of design classes before college. I was able to design in my head very well, so putting my ideas down on paper was more for communication of the design rather than developing a design. I was co-captain of our Formula SAE team at University of Wisconsin-Madison in college in which we took 5th out of 80 teams in the driving events of the worldwide competition. Success in FSAE was significant to achieving a great position in Light Truck Advanced Chassis at Ford Motor Company right after graduation in 1993. I became the first chassis/vehicle dynamics engineer for Ford Racing in the NASCAR Craftsman Truck Series in 1995 – 1996. 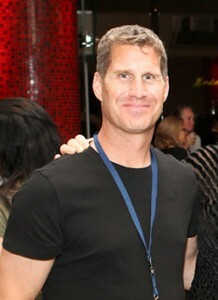 Success in the Craftsman truck series led to a position in a new motorsports group at Ford formed by then VP, Neil Ressler. I was selected to be the vehicle dynamics engineer for Team Rahal in ChampCar in 1996. It was supposed to be a 2 year assignment, but lasted 5 years. I worked with Rahal, Herta, Papis and Brack. Incredible experience. All of my work was heavily predictive with immovable timing. As a side note, the 1967 GT40 Mark IV of Foyt and Gurney (J4, I believe) is my favorite car in the world, and happened to be my computer screen background during this six year period. In 2001, Ford Racing sent me to grad school while also supporting my vehicle dynamics teammates in the various top racing series including F1. At this time I caught wind of the potential of Ford doing the GT40. I talked Neil Ressler about this potential and asked him to consider me for this work in chassis design and/or vehicle dynamics. Neil knew me well from my ChampCar work with Rahal and he was my thesis advisor for my masters. Neil noted Ford was considering hiring the whole project out to a company like Pininfarina, but would let me know. Lucky for me, they chose to do the GT in house and I was quickly moved from Racing to the GT program early in 2002. I was the first engineer to the program outside of the 3 who had worked on the initial feasibility study with Camilo and company. Ultimately, going after the assignment, knowing the right person and having the right background, led to my role on the GT. What was the highlight of working on the program for you? This is a tough question because there were many highlights, but I would have to say the Ford Centennial was the most significant. It was quite a celebration with our work being the center piece. The timing, team size and level of car was a huge accomplishment for our team and the Company. Were there any particular incidents or events during the course of the program that were particularly memorable? Driving nearly 200 mph for about 5 laps at MPG on the 5 mile oval; a truly unbelievable feeling. The feeling of speed, in the corner and in general, the sound of the expansion cracks in the corners banging off at tenths of second while covering so much distance in such little time. Standing on the edge of the track watching teammates hit 200 on the oval and watching the aero push the car down, seeing the pressure wave off the front and then feeling it as the car goes by, the sound and just seeing the speed. Denis Breitenbach’s reaction after watching Jeff Walsh and I destroy CP4 during a rapid tire deflation test gone awry! Personally test driving the first 50 cars at MPG…cars going to very high profile people. The first time I saw what seemed like a “sea of Ford GTs” at Wixom at the end of line. The Ford GT team members (about 30 of us) Q&A with Bill Ford Junior after the program. With a lot of race car background, what was it like having to balance the OEM desires for a compliant road car vs the desire to make a max effort performance vehicle? For sure a little tough…I hadn’t worried about anything but winning for the prior 6 years in racing. However, pushing the clearly defined and ranked goals helped solidify what we were designing and the associated tradeoffs. So even though performance was at the top of that list, the refinement level of the car was very important. The F360 Modena was a great benchmark and example for these tradeoffs. Had guys like myself gone for pure performance we would have probably ended up with something that feels like a high end kit car with driveline vibrations, frequencies lining up at certain RPMS, constant creaks and groans, wind noise, etc. To me, to most of our team, these were not acceptable characteristics of the Ford GT. Fortunately, that knowledge helped me quickly get back into passenger car mode…a very, very high-performance passenger car. What was the biggest challenge during the program for you as a vehicle dynamics engineer? That’s a toss up between the tires and battling against weight, CG height and weight distribution! It took a great deal of work from our team to help Goodyear understand and achieve our goals and requirement. This was especially tough in our period at Ford with new and very difficult high speed testing requirements (after the Firestone debacle) way beyond the limits of what Ford had ever done. The original overall curb weight target was 3350 lb and we ended up at 3500 pounds with a CG height a few percent above the benchmark. Weight, CG height, weight distribution and tires dominate low to medium speed vehicle dynamic capability, response and character. Many on the program would say, “can’t you make up for weight or CG penalties with a better suspension? !” No! The suspension geometry and characteristics are very important, but more from a refinement standpoint and secondary for pure capability. Fortunately, we hit our weight distribution target (57% rear), but at the expense of front luggage space. It all worked out, but the weight and CG height above targets had us sweating every detail we could control. Was there anything you would have changed about the GT in retrospect as we approach nearly ten years from the start of production? Hmmm, a question I have contemplated since the program. Our crazy timing constraints and Ford core competency drove some significant decisions. There is not a lot I would change given the same constraints. However, I would have changed multiple items big and small given another run at it, with a little more time. I will note a couple of them. Chassis examples – anti-roll bar package I would do differently to be more effective and easier to install…the front bar is a pain to install. However, this results in very little customer impact. I would use different control arm joints at the frame. At the time, I would go after aluminum brake rotor hats instead of the one piece cast iron units. Now I would go after ceramic brakes. These are smaller examples, from my perspective. Powertrain – I would attack the Achille’s Heal with even greater vengeance – engine cooling when pushed hard. 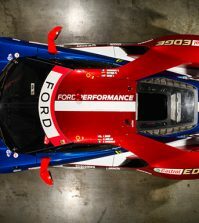 In the end, the team chose the one engine architecture at Ford, within its core competency and timing, which would reliably and confidently hit the HP numbers. However, the penalties for weight, CG height, complexity and cooling were significant compared to a naturally aspirated V8 hitting those numbers. If we had more time, for sure it would be worth another look. As a guest as several GT Rallies, does it surprise you that so many owners have been willing to really take the car out and drive it hard, and did it surprise you that so many owners have pursued a more track oriented setup? We designed and developed the GT to be pushed very, very hard on-track, but we had no idea how many would really take advantage of that capability. So while it was our intent, it has been a very awesome surprise to see so many push their cars hard and have the fun that was intended. At the same time I don’t think any of us envisioned the level of modification and track bias that many have gone after, so that is a very big surprise for me. I like it a lot. After you left FMC, you did a lot of chassis development in NASCAR for Roush Fenway and Richard Petty. What is that experience like? It is very cool in many respects, yet tough to take in others. The game in NASCAR has changed a great deal in the last 10 years, heavily because of the influx of us engineers from the ChampCar days and rule changes. It is much different than people expect in NASCAR in which the rules are much more open on design, especially for chassis, than IndyCar, at this point. For example, we can define our own suspension geometry within a pretty large envelope. This is not currently allowed in IndyCar. Only a few fixed geometry options from the chassis manufacturer are allowed in IndyCar. However, almost all racing series are way more restrictive than 10 years ago due to costs. Cost reductions are a big part of the success of engineers in NASCAR because they eliminated testing at NASCAR sanctioned tracks 6 years ago (other than a few Goodyear sanctioned tire tests each year) so we have to be heavily predictive on the setup. The old school crew chief and driver setting the car up by seat of the pants is gone in the top teams. Driver feedback on the car’s behavior and what they need it to do differently is critical (especially with little data acquisition allowed), but they no longer lead the base setup direction. Therefore, we honestly approach the problem very similar, and even more advanced, than my days in ChampCar, because the same laws of physics apply, just a different set of tradeoffs. Yes, the technology in the cars themselves is still way behind in NASCAR, but the technology we use to help determine the best setups is cutting edge. We laser scan and GPS measure every track so we can represent every bump, banking, corner radius, etc. We set the cars up differently for every track type and then adjust for each driver. Our feedback and learning is immediate and continual regarding our design and development path. The amount I have learned due to just shear hours of focus, as well as the constant feedback, is immeasurable in all my years in racing. Working with the best of the best has certainly been one of the greatest elements of the experience, whether drivers, owners, engineers or mechanics with a singular focus – winning. I would say most that have been there for a number of years were born to do what they do, with the drivers at the top of that talent. Watching guys like Carl Edwards wheel this 3600 lb “taxicab” on tiny tires at 190 mph through the banking at Atlanta and drop the left front down on the apron to free the car is absolutely unbelievable. And then come in and give us detailed feedback! For sure there is the glamorous side – traveling in private planes, including flying right seat with Jack many times – before his last crash! Interfacing with “famous” people often, being on TV, etc., but unless you are a driver or owner, that happens less than 1% of the time. You have to absolutely love the racing, the engineering and want to compete very badly because it consumes your life. Everything else is way secondary when you spend 70 – 90+ hours a week, 7 days a week for 36 races a year. And there is NO offseason. It is the longest season out of any sport and extremely taxing. However, it is one of the greatest feelings of accomplishment when you are a big part of a win on that huge stage. I ended up having an “offensive coordinator” and leadership role on setup while there, so I was able to make a significant contribution to 30 wins and 2nd twice in the Championship while I was with the two teams. One of the big downsides to me, however, is the very narrow focus, which is heavily on pure analysis. I like and excel at every aspect of automotive product development from architecture definition to design, development and manufacturing. This is one of the reasons I moved on from my NASCAR work at the end of 2012. I have a few different irons in the fire. I am working hard to further build my company for automotive product development and motorsports engineering services. The product development services are for OEM customers, like Ford, as well as for my company’s own chassis products. I am actually working on my first Ford GT chassis items for sale in the near future as part of my business. These parts will be designed, developed and manufactured at a very high level like we did on the GT. I will keep you guys posted on status. I am working on my website, which has a good landing page, but the details are still under construction and should be completed soon. The site is www.AhlmanEng.com. This is also where you can check back in the future for updates. I also have a small architecture, engineering and build company with my wife, Angela, who is a Civil/Environmental Engineer by degree, but has heavily been a commercial building project manager over the years. I designed, engineered and co-led the build of a very sustainable modern home with Angela over the last three years. I have always loved building design and it provides me another significant outlet for creativity. I am a “form and function are one” kind of guy, so designs must be beautiful, but also function extremely well. If the right opportunity presents itself, our intent would be to architect, engineer and perhaps lead the build on similar projects. Landing page and photos at www.PuraVida-Design.com.